Red Lights and Rights: How Much is Your Freedom Worth to You? Author Kimber Fountain believes in the importance of freedom and liberty, in all of its forms. Here, she talks about the unique freedom many girls found on “the Line” in Galveston, Texas. 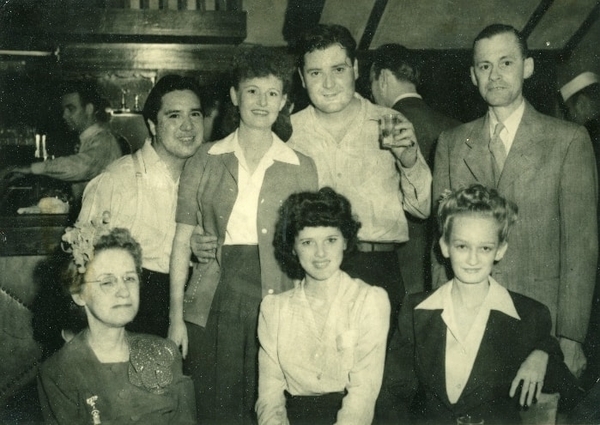 Read on to learn more about some of the girls who worked Galveston’s red-light district, and the freedom they sought after! The word “liberty” is scrawled across t-shirts and stamped onto koozies every year on July 4th as an ubiquitous moniker of patriotism, but the true essence of the word is one that should command the highest respect—after all, it was the word upon which our very nation was built. To the Founding Fathers, liberty was synonymous with “freedom” (yet another word that has since been exploited and marginalized), and it had nothing to do with the military or foreign intervention. To Samuel Adams, liberty was the very basis of his existence, an innate right to the ownership of himself. Jefferson, Franklin, Hancock—they all believed with unwavering conviction that every individual is inherently endowed with absolute freedom, so long as the exercise of said freedom does not infringe upon the rights of another individual. They risked their lives to perpetuate this truth, using it also to conceive a kind of country that had never before existed. 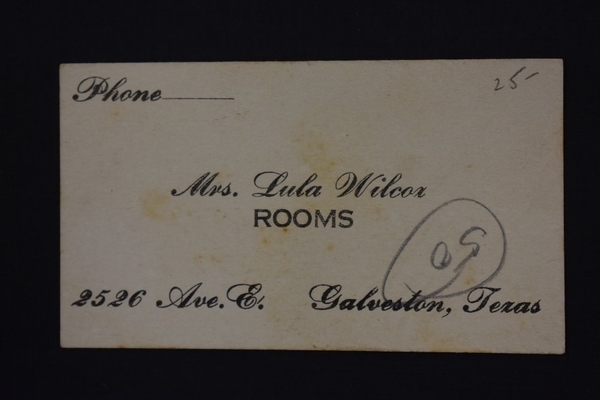 Calling card of Lula Wilcox, known madam of "The Line" who like many other madams operated a brothel under the guise of a boarding house. Of course, all that these great men actually did was to set forth an idyllic premise. They themselves were not entirely without their own personal shortcomings, and neither did the United States truly begin to look like a free society overnight. But the foundation they crafted is still in place and the legacy of independence they set forth still continues to reveal itself to this day as slowly, but surely, we run out of “categories” of people who have historically been denied those basic rights because of societal constructs. And sometimes, that legacy is found in the most unlikely of places. For instance, many would consider it heresy to forge a parallel between a nation of ideals and an early 20th century prostitute in Galveston, Texas, yet when the moral judgment is scrubbed away from the women who dared to adopt such a job title, they are revealed to be the utmost of patriots, the bravest of pioneers, and the most daring of trailblazers—not because of what they did, but because of why they did it. Madam Mary "Gouch Eye" Russel (far left) preferred to cater to upscale clientele and always employed young, well-kempt college girls at her houses. Women who lived in the United States in the early part of the 20th century could not vote, they could not go to college, they could not own real estate, or even have a bank account unless they were married. The only viable jobs available to them were sewing, pecan shelling, childcare, or secretarial positions—and a woman in Galveston’s red light district could make as much from one client as she could an entire day at one of these tasks. During World War II, employment opportunities for women were unbridled because of the shortage of labor, but as soon as the War was over, media and politicians launched an all-out attack on female autonomy, using television shows, print ads, and other various propaganda to relegate women back into a life of domesticity. This is of course a legitimate and honorable path for any woman to take, but only if it is a choice. 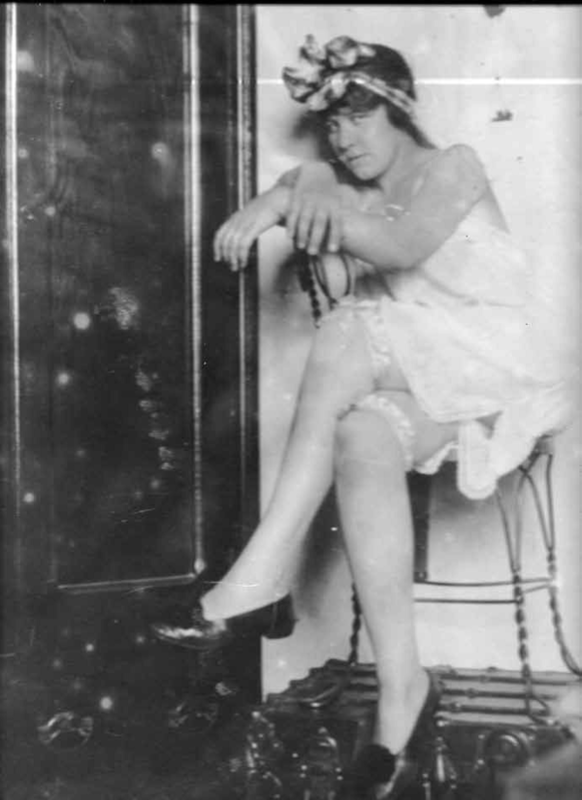 Thus for the women in Galveston who worked “The Line,” the ones who dreamed of being aviators and entrepreneurs, the question should not be why these women wanted to be prostitutes, but why they felt they had no other choice. Girls on the Line owned automobiles, and socialized with famous entertainers and the political elite; they had savings accounts, cash to spend, and credit ledgers at local department stores. But even these niceties were not enough to counteract a lifestyle that also brought with it at times a high probability of arrest, a proclivity for violence, and a risk of disease and unwanted pregnancies. Nothing but freedom could be worth so much. The only remaining photo from a collection of parlor photos commissioned by a Galveston madam; the photos were hung up in the parlor of her house for men to peruse and make their selection. For these particular women, freedom was so important, they were willing to risk their dignity for it. They were willing to shun themselves from polite society, and fly in the face of a powerful moral undercurrent, all for the sake of liberty. Thus without even knowing it, they became symbols of another type of revolution. Not the type that forged a nation, but the type that would expand the consciousness of that nation. History has proven that the moral vigilantes who set out to abolish Galveston’s red light district did so to no avail, yet the flagrant peddling of promiscuity did eventually die out in the island city. Not coincidentally, the fading of the Line from Galveston’s cityscape was in lockstep with Second Wave Feminism of the 1960s, which fought for equal employment opportunities and other fundamental changes, proving that it was never really about rebellion, nor was it really about the income or the opportunity. It had always been about one thing and one thing only—the price these women were willing to pay for freedom. Kimber Fountain is a native of the Texas Gulf Coast and a longtime resident of Galveston Island. After earning a bachelor of arts degree in theatre and dance from the University of Texas at Austin, she lived in Chicago for several years before moving to the island where she soon discovered a love for the city’s history while working as a tour guide on the Strand. Currently, Kimber is the editor-in-chief of Galveston Monthly magazine, where she has been a feature writer since 2015. She also serves as chair of the Arts & Historic Preservation Advisory Board to the Galveston City Council. This is Kimber Fountain’s second book from The History Press; Galveston Seawall Chronicles was released in May of 2017. To read more of Kimber’s work, check out her book below!